Mass movement (commonly referred to as landslides) represents a geological process where surface materials move downhill by gravity. 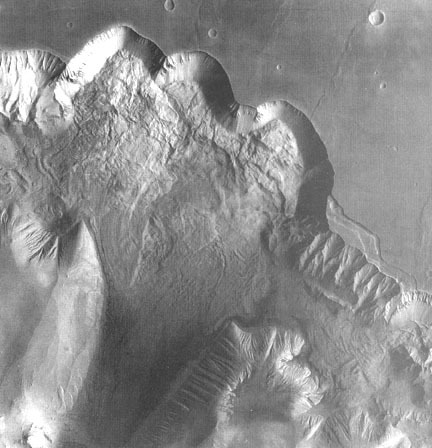 Most of the Martian mass movements occur in Valles Marineris, the Grand Canyon of Mars. Figure 2.1 shows a section of a collapsed canyon wall. At the top of the picture, a rock avalanche at the three curved walls is clearly visible. There is also a large amount of debris accumulated at the foot of the walls. A close-up view of the central curved wall is shown in Figure 2.2 . 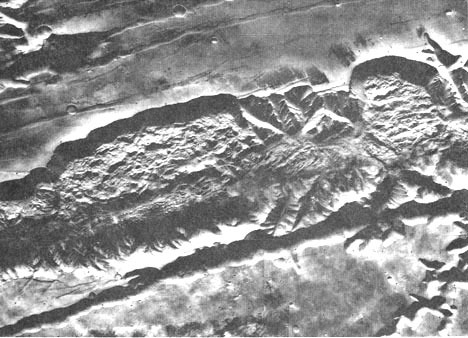 The fan-shaped feature at the bottom is the front of a debris flow on the valley floor. Figure 2.3 is another view of debris that piled up to modify the valley floor on a large scale. Notice the lineated tectonic grabens on top of the plateau. (Graben represents a downthrown block of land mass produced by horizontal tensions.) 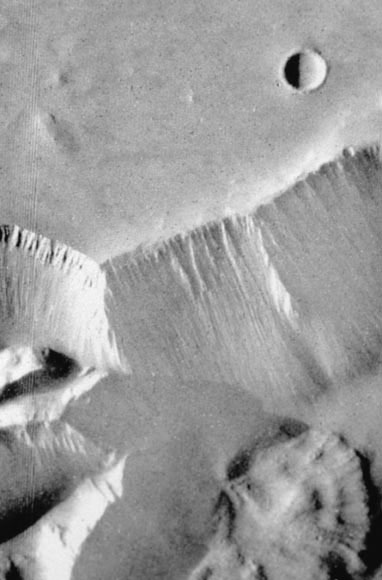 The existence of these linear grabens suggests that Valles Marineris was probably formed by horizontal stretching of the regional tectonic stresses. 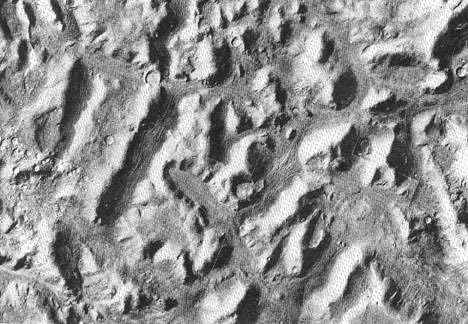 Another interesting feature occurred on the valley floors of the fretted or chaotic terrain as shown in Figure 2.4 . Notice the lineated features on the valley floors. They were probably formed by the debris deposits coming off the steep walls. There may be some slow, glacier-like, down-slope movements parallel to the lineations, but much of the movements are in the direction perpendicular to these linear features.